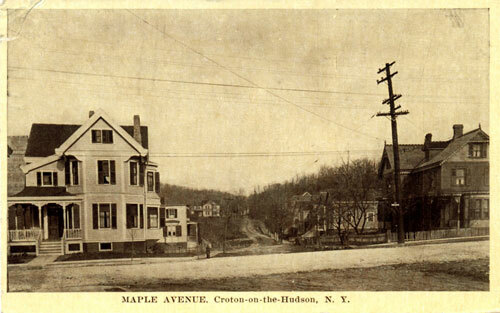 This selection of vintage postcards shows Croton in the first half of the 20th century. Some of the images are of places we still see today, others are long gone—but should not be forgotten. Thanks to Susan Hack-Lane, President of the Taconic Postcard Club, for providing these postcards. By any measure, the “new” Croton Dam is an engineering marvel. For 14 years (from 1892 to 1906) 1,500 men used more than 500 pieces of heavy machinery, 745,000 barrels of cement, 100,000 tons of coal and an incalculable quantity of locally quarried stone to construct what was then the tallest dam in the world and the largest hand-hewn masonry structure since the pyramids. Also known as the Cornell Dam, after the family who owned the farmland where the dam was built, the New Croton Dam replaced the “old” dam, which lies underwater near the Croton Lake Bridge, where the Taconic State Parkway crosses the reservoir. “The Bowery” was the name for a group of buildings along the Croton River (roughly parallel to Route 129, between Riverdale Drive and Batten Road) which housed Italian stone workers who helped build the Croton Dam. Note that the label on the card incorrectly refers to the “Quaker Bridge Dam”. The significance of this error is explained at the end of the tour. In 1915, if you were standing in front of where the Blue Pig is today, looking in the direction of Old Post Road South, this is what you would see. The rough dirt road going into the distance in the middle is Maple Avenue, going toward the Croton Dam, and the road in the foreground going left to right is Old Post Road South. Most of the buildings in this image are still standing today. Built in 1875, dedicated in 1883, Asbury United Methodist Church is named after the founder of American Methodism, Francis Asbury. Listed on the National Register of Historic Places, the church is a fine example of High Victorian Gothic style architecture featuring locally-made bricks and a multi-colored slate roof. As you drive along Old Post Road through Croton you may not realize that you’re on one of the most historic roads in America—an ancient native American path up the Hudson, later widened and marked with milestones by then-postmaster Benjamin Franklin. 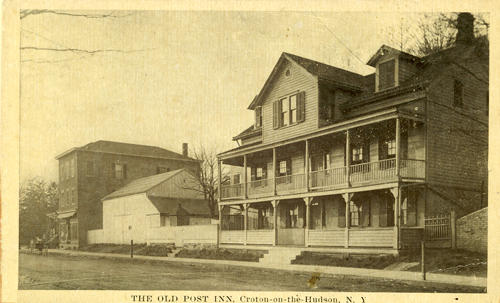 This postcard shows the Old Post Road Inn, once located on what we know today as Grand Street. It was built in the 1700s and was a popular stagecoach stop on the way between New York City and Albany. The inn burned down, but the brick building on the left is still there—the Cornelia Cotton Gallery is on the bottom floor. 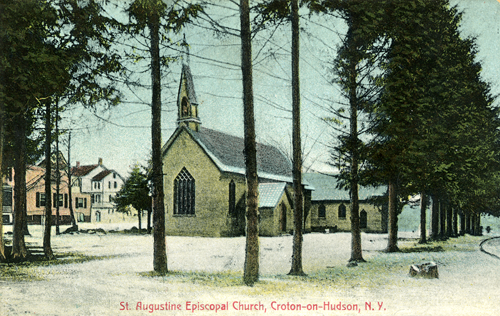 Located on corner of Grand Street and Old Post Road South, St. Augustine’s Episcopal Church was constructed in 1857 on land donated by Philip Van Wyck. The design was copied from wooden church in Sleepy Hollow, but the structure was built from locally-made brick. The steeple bell was a gift from Anglican Church of England. What we know today as the Municipal Building was originally the Croton Union School, built in 1909. It remained a school (for grades one through twelve) until 1939 when the Pierre Van Cortlandt school was built. The entrance on Van Wyck Street we use today is actually the back side of the building. This view shows the grand staircase entrance from Brook Street. 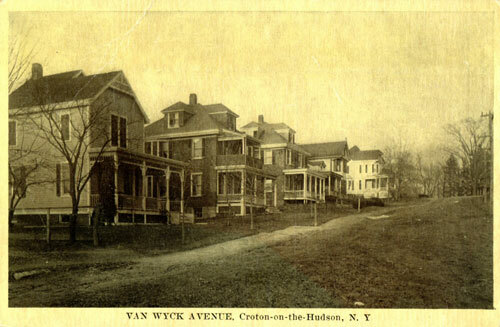 This postcard shows some of the grand houses that lined Van Wyck Avenue in 1916. This postcard shows Riverside Avenue, looking north, in roughly 1925. Sadly, almost everything on the left side of the road—the entire waterfront business district of what was originally known as “Croton Landing”—was demolished in the early 1960s to make way for Route 9. The sole exception was the Croton North train station, which is shown below. Built circa 1900 as the Croton-on-Hudson station for New York Central Railroad, renamed Croton North in 1963 and discontinued in the 1980s. Listed on National Historic Register, the style is brick Romanesque, featuring a bay window for the station master and a slate/tile roof. Today, the building is the office of F.A. Burchetta Co., electrical contractors. This view of the Croton waterfront circa 1907-1914, probably shows the Osborn Boat Works, which moved from Peekskill to Croton in 1902. William R. Osborn had an excellent reputation for the quality of his steam and sail boats. A fascinating history of the Osborn Boat Works was compiled by the Croton Historical Society and can be found here. This postcard of Van Cortlandt Manor, circa 1907-1914, shows the building when it was still a private residence, owned by descendants of Pierre Van Cortlant. The once grand manor had been reduced to just a few acres and the architectural details of the house had been altered. In 1953 the house was purchased by John D. Rockefeller and the buildings and remaining land were painstakingly restored to their 18th century appearance. Built circa 1710, the ferry house was owned by the Van Cortlandt family, but leased to a local operator who paid monthly rent. The ferry, which connected two sections of Albany Post Road with weekly stagecoach service between New York City and Albany, was a flat-bottomed 32 foot scow, pulled across the river by ropes stretched to both shorelines. During much of the Revolutionary War, the ferry was the only way across the lower Croton River, so it was closely guarded by American troops. Built 1907 by real estate developer Clifford Harmon as part of a plan to bring professional theater and film stars from New York City, Nikko Inn was a rustic Japanese teahouse and later, a speakeasy. Located at 80 Nordica Drive, high up on the edge of the Croton River gorge, the building featured beautiful stone and woodwork with a Japanese motif, a huge fieldstone fireplace and porches on three sides. Today, Nikko Inn is a private residence. The Mikado Inn was built around 1920, across from the Nikko Inn, by disgruntled employee of Clifford Harmon. Located on Truesdale Drive, it featured unusual landscaping, a restaurant with outdoor pavilion dining. The inn was converted into apartments in the early 1950s and features long balconies, stone walls and an unusual gable roof. “Deep Hole” is said to be the deepest part in Croton River. Tradition says 150 feet, but the actual depth is 26 feet. Surrounding cliffs included the famous Nikko Inn and Playhouse, built by real estate developer Clifford B. Harmon, circa 1907, as a weekend rendezvous for movie stars like Mary Pickford and Douglas Fairbanks when Hollywood was located in New York City. Gondolas from the Inn plied the waters of the river with invited guests. 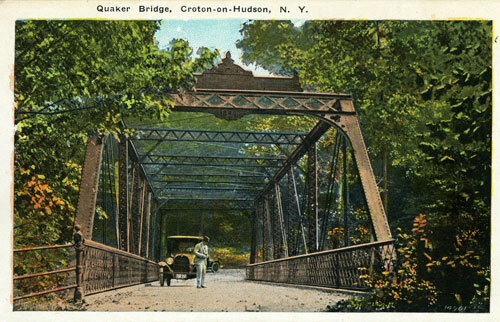 The Quaker Bridge we use today was built in 1894 and is one of Westchester’s oldest surviving bridges. Indeed, survival was a real issue with 18th and 19th century Croton River bridges, because spring “freshets” of melting snow or heavy rain tended to wash away early wooden bridges with surprising regularity. The 1894 bridge is actually the fourth bridge built at this location. The first was built in 1809, to carry Albany Post Road traffic across the river, avoiding the cost of the ferry at Van Cortlandt Manor. That bridge was rebuilt in 1830 by local Quaker preacher, William Purdy, hence the name “Quaker Bridge”. In 1841, Purdy’s bridge was swept away—along with all the other Croton River bridges, many houses and several mills—when part of the original Croton Dam collapsed, releasing a torrent of water that was 50 feet high when it roared through the narrow Croton River Gorge. The dam was repaired and improved, so when the third bridge was built in 1847 it survived for 47 years until the current Pratt truss style bridge replaced it. One of the most interesting things about Quaker Bridge is what was not built there. In the late 19th century, when New York City was rapidly outgrowing it’s water supply, the Quaker Bridge area was the subject of extensive planning for a new dam that an article in the New York Sun in 1888 called “The Biggest of All Dams … the Gigantic Structure at Quaker Bridge.” Luckily, the planners decided against the Quaker Bridge location in favor of one further up river.